The Content Station 10 Desktop app communicates with other applications, including Enterprise Server. When the connection to Enterprise Server is done through a proxy server, configuration steps may need to be performed. 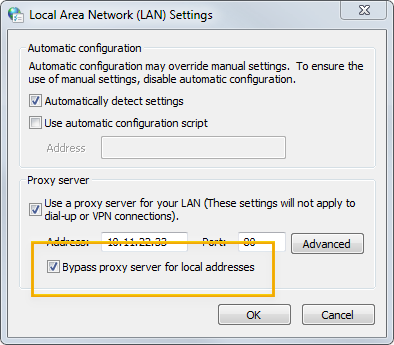 Connecting to a proxy server requires Content Station 10.16 or higher, running in Google Chrome, and using the Content Station Desktop app. It is assumed here that it is fully installed and running. For details, see Using the Desktop app of Content Station 10. The configuration steps to perform depend on the version of the Desktop app that is used. The version of the Desktop app that is provided with Content Station 10.28 or higher uses the proxy settings that are configured in the operating system on which the Desktop app is installed. As a result, no configuration steps are needed in the Desktop app itself and no proxy settings are available in the Desktop app. 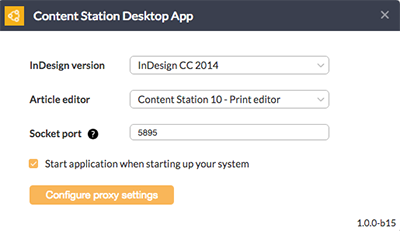 The version of the Desktop app that is provided with Content Station versions 10.16 to 10.27 contains options for configuring the proxy settings. Step 1. 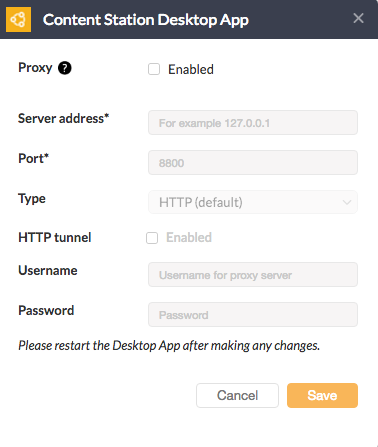 Click Configure proxy settings. Enabled. Select or clear the check box to quickly enable or disable the feature. Server address. Enter the address of the proxy server. Type. Cannot be changed. Is set to HTTP by default. HTTP tunnel. Defines whether HTTP Proxy tunneling should be used or not. User name and password. (Optional) Enter the user name and password needed to log in to the proxy server. Step 3. Close the Desktop App and run it again. 10 August 2017: Split the instructions for Content Station version 10.28 and higher and for version 10.16 to 10.27.